→How To Choose A New Dive Computer? So, you finally decided to buy a dive computer but quickly release that there are many different types and styles to choose from. Whether or not you choose a console or wrist mount, air integration, hose or hoseless, or one with Nitrox capabilities there is no doubt, that your newly acquired computer will soon become your new best friend underwater. But, which type is best for you? The type that works best for you will largely be determined by your personal preference, the type of diving, your overall budget, and the type that works best with your current gear. Before you go out and buy just any old computer, there are a few questions you must as yourself. How Am I Going Go Mount The Dive Computer? Do I Need Air Integration Or Not? Will I Dive With Nitrox? What Are Some Features I Should Consider? How Do I Maintain My Dive Computer? This is the first questions you should ask yourself when looking to buy a new dive computer. This can either be a wrist, a watch, or console mounted, each has their own advantages. Where you are going mount the dive computer all boils down to your personal preference, as there is no best place to mount them. Now, let’s look at some of the mounting options available. Just as the name implies, these types/styles of dive computers are mounted to your arm similar to watches, but just a little bit larger. One of the major disadvantages of owning these types of computers is the fact they are not directly attached to your dive equipment and can easily be misplaced. However, because they are not attached to your dive equipment, they can also be used for a depth gauge and timer while free diving. When researching dive computer you will soon notice that many models of wrist-mounted dive computers can also be mounted into your console as well. This is a great benefit because it gives you the option of mounting your computer both ways without having to buy separate dive computer. 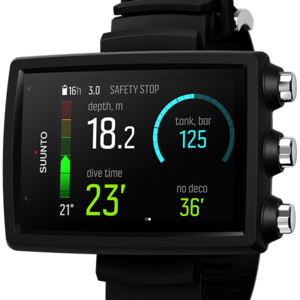 These are watch-sized dive computer that serves a dual purpose as a watch and dives computer. Many are stylish enough to be worn as an everyday watch at work or special event but still have all the capabilities and features of a top of the line dive computer. One of the main drawbacks to owning these types of computers is the smaller screen which can be harder to read if you have problems with your vision. Console Mounted Dive Computers generally combines a pressure gauge, dive computer, and often a compass in a convenient location. They attached to your regulator via a hose, and are relativity larger with bigger displays than their wrist-mounted counterparts. Console computers are not always air integrated. To show pressure reading it needs to be directly connected to your tank via a hose or hoseless transmitter (more on these below). Those that are not air integrate typically come with a pressure gauge, mounted in the console as well. Because they are connected to your dive equipment it makes them a lot harder to misplace. One of their main disadvantages is that they can burn through batteries quicker, as they are activated sometimes when you don’t need them, for instance in a pool during training. Now that you’ve decided which type of mounting you prefer, its time to decide whether you need Air Integration or Not? Air Integrated computers are connected to your air source and display your current air pressure digitally on your dive computer. A great benefit of air integration is that it allows your dive computer to calculate your current breathing rate, and tell you how much time you have left at your current breathing rate. You generally have to pay a few hundred dollars for an air integrated dive computer, if you can afford it this feature is defiantly worth it. Air Integrated computer comes in two basic types either hose or wireless. 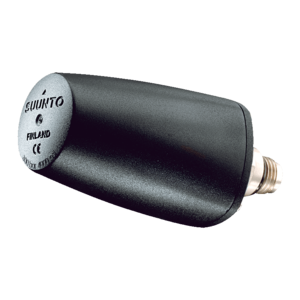 wireless is the more expensive of the two and consist of a transmitter that attaches to the high-pressure port of your scuba regulator first stage and sends the air information wireless to your dive computer. Having a wireless air integrated dive computer cuts done on the amount of hose you need and make you more streamline while diving. Some dive computer today can even read from multiple transmitters, which is great from keeping an eye on your body. These are also perfect for a technical diver who may use multiple tanks on one dive. Air Integrated dive computer connected by hose give you your air information directly from your high-pressure hose. Many of them come with a quick disconnect hose, in the event you need to detach your computer from your regulator for logging dives or storage. It is said that a diver diving with a Nitrox mix of 36% consumes about 12 percent less gas than a diver using normal Air. Because of this diving with enriched air has become more popular in the last few years, and so have computers with Nitrox capabilities. 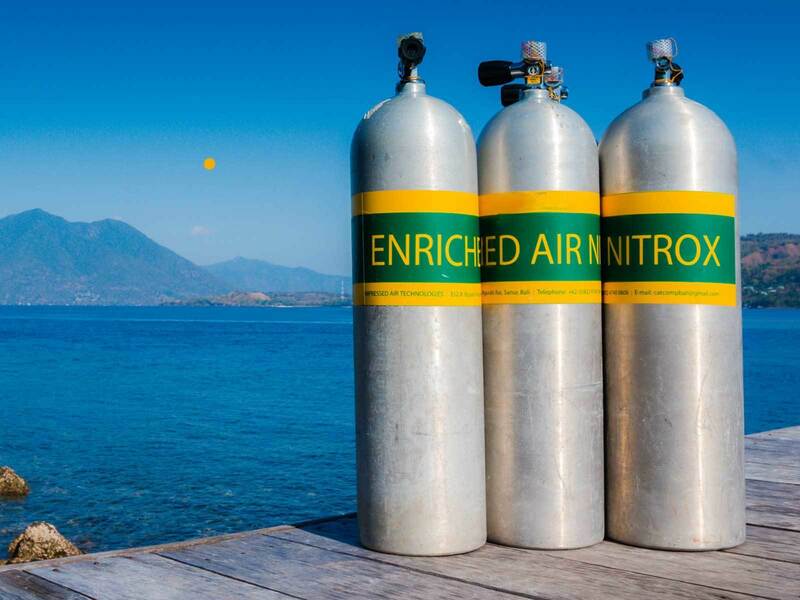 If there is a slim chance that you will dive with Nitrox in the future, then I would strongly suggest that you purchase a computer with enriched air capabilities. This will save you the expense of having to buy a whole new computer in the future. The difference in price is only slightly different that one without, and nowadays most manufacturers are starting to produce all their computer with Nitrox. However, if you would like to save a few bucks and are sure that you will not dive with Nitrox, then purchasing one without this capability is perfectly fine. keep in mind thou, that if your computer can calculate Nitrox then it can also calculate air diving as well, but this does not work the other way around. In the early days, dive computer could only offer basic decompression calculations based on your dive duration and depths to ensure that you have a safe dive. As technology evolved over the years, so has dive computers. Today, they are packed full of features to make your diving easier, safer, and overall more fun. However, with all the new features available, choosing a modern dive computer can be bewildering. Below are some of the more important features you should consider in a dive computer. 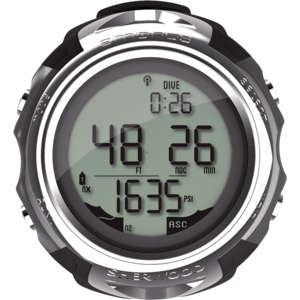 One of the first features of the dive computer you should consider is its display. This is where you will access all the information you will need during your dive. The ability to read the display easily and accurately is vital to your safety. When choosing a display you might want to consider the type, the size of lettering, and whether or not it has backlighting. Let’s look at these in more detail below. At the moment there are basically three different methods that dive computer uses to display dive data on the screen, these are Segmented, Dot Matrix, and Color. Generally found on most entry-level dive computer, a segmented display uses segments of line to form characters much like a digital watch or calculator and can be harder to display complicated information. Lettering can sometimes be hard to read and would require reading the manual to decipher. Dat Matix uses a cluster of small dots on the screen to display more complicated information and are generally much easier to read than segmented displays. They can spell out more defined characters, and can even project a graphical representation of your dive as well as a digital compass. These displays are normally found on mid-priced computers and are sometimes combined with segmented displays. 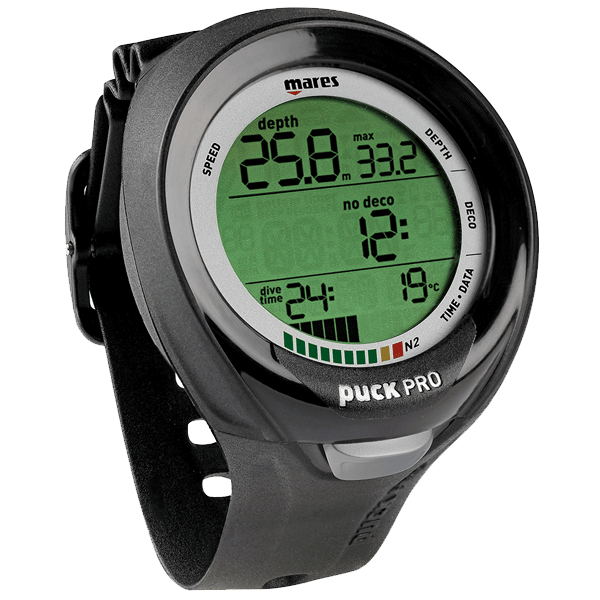 Found on more high-end computers, it delivers much greater detail and the multicolored display can highlight critical dive info. They are much easier to read in low-light condition but requires much more energy so they tend to use rechargeable batteries. 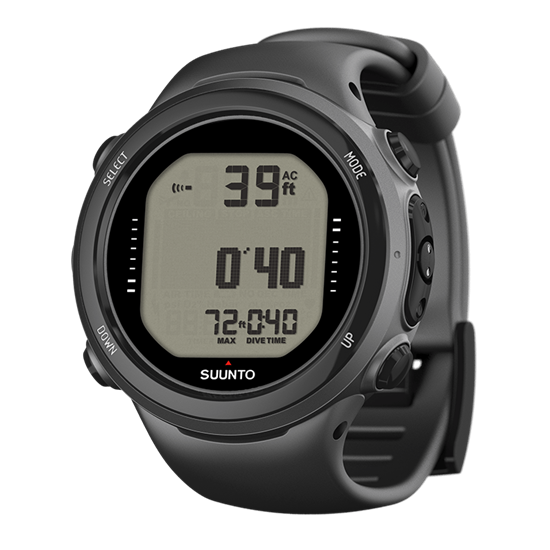 The size of the display is also very important, especially if you’re going to be diving in very low visibility or if your eyesight is not what it used to be. It’s not practical to buy a watch-sized dive computer if your eyesight is dwindeling. Back-Lighting on your dive computer allows you to read the display in low visibility or night without using your flashlight. Today, even the most basic dive computer comes with this feature because it is something that many drivers will not go without. Pretty much all dive computer allows you to review your dive history. However, the amount of data and dive that are logged generally depends on the model. Older dive computer models would only show you data from your most recent dive. Now, the average computer can give you information on your last 25 dives, with more expensive dive computer storing quite a few more dives. When choosing your dive computer it is very important that you pick one that will record enough dives. If you only dive a few time per year you will not need as much memory as someone who dives couple times per week. Having a dive computer with alarms is very useful, especially if you’re new to scuba diving because they keep you safe by alerting you when important dive limits are approached. These can be both visual and audible alarms to warn you if you are ascending too fast, or approaching your no decompression limit, etc. It is important to read your dive computer manual to understand what each alarm means. Many computers today also come equipped with user changeable batteries. This is a very important feature to have especially if your computer batteries die on a dive trip. It only takes a couple minutes to swap out batteries, instead of having to send it into the service department, saving you a lot of money on maintenance costs. It is good to keep in mind that, only a few of them have watertight battery chamber which means that if it is not sealed properly water can get in and ruin the entire dive computer. Because of this many divers still, take their computer to a service center to have the battery changed. Dive computer can be activated in two ways, either manually by the diver or with water. Many dive computer would require you to press a button before beginning your dive. However, many drivers forget to activate their dive computer an fail to capture their dive details. To solve these problem dive manufacturers now makes dive computer that activates as soon as you enter the water. If you feel that you might forget to activate your computer before diving, then this feature is a must. However, dive computer with this feature is a little bit pricier. Many of the new dive computers now allow you to download all your dive detail to your PC (Personal Computer). While your dive computer might only allow you store limited dives, by downloading them to your computer you can actually store the countless amount of dive data. But, downloading your dive information to your PC normally require that you by software and cable separately (some dive computer packages comes with this included). 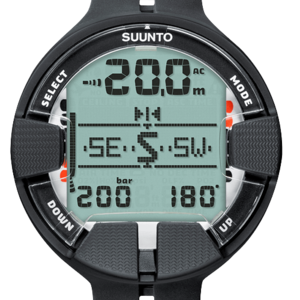 Depending on the software it can convert all your dive info into graphs to show you depths during the dives, and the time spent at each depth. They can also chart more detailed information like missed decompression stops and rapid assents, how good you are at air consumption (Air Integration Needed), and your predicted nitrogen saturation level. Underwater your field of vision is not as good as it is on land, and as a diver, you need to know where you’re heading and how to get back to the shore, or your boat. This is the reason why a compass is a vital part of your scuba diving gear. Compass are generally mounted in your dive computer console or can they can be worn on your wrist. However, in recent years dive computer can now supplement and even replace these old fashion compasses with digital ones. Some to the higher end computer go as far as integrating Global Positioning Systems (GPS), which uses satellites to pinpoint exactly where you are and where you have been. This feature is great for diver doing search and recovery, fishing or crabbing, or treasure hunting. 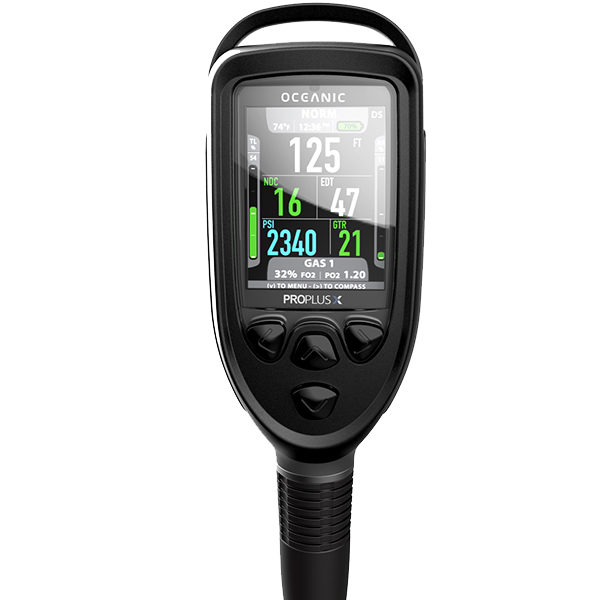 Your dive computer is designed to be rugged and durable to withstand the high pressures of the deep and other extremes. Although you would like them to be, they are not perfect and need to be maintained from time to time t ensure that they work properly. By caring for your dive computer now you can save yourself a lot of headache in the further. There is not much that goes into caring for your dive computer and would only take a few minutes after each dive. Below are a few simple tips to properly care for your dive computer. Occasionally Clean Mental Contacts – From time to time you will want to clean any metal contact with a soft toothbrush to remove any hard deposit from salt, perspiration, or sunscreen. Store in a Dry, Cool, and Ventilated Area – If not in use store your dive computer away from sunlight, heat, or chemicals as they can weaken the waterproof seals. You would also want to avoid prolong storing in damp areas. Get Manufacturer Recommended Service – You should also send your computer to get service every one to two years by a certified Service professional. They will calibrate the computer, as well as check all the seals and functions. The above are some of the most important features I believe you would want to look for in a new dive computer. A good dive computer does not necessarily have to have all these features the one you choose will depend mostly on your budget and personal preference. It is always good to read dive computer reviews to find out all its features and capabilities. Now that you know what features to look or when buying, your new dive computer you may dive computer comparison chart to quickly compare the features of most of the best dive computer on the market today.